Watching Giovanni Caruso prune an olive tree is like observing a mountain climber decide how to reach the next hand-grip in a cliff. He chooses his path with deliberation. He even wears a helmet. With a set of newfangled tools and theories, this 35-year-old Sicilian biologist and self-made pruning expert is working on his first commercial project to introduce the central Italian technique known as the “polyconic vase” into Sicily’s often remote and overgrown olive groves. This method seeks to sculpt a tree into separate cone-shaped sides, thus producing more olives that are easier to pick. “The cone’s geometric shape allows the most branches to be exposed to the sun,” Caruso said. I thought about the overgrown olive trees I bought a few years ago with my wife and two boys on a property in Sicily. This was the first year we pruned them, nervously trying to open them up to the sun as we’d learned from Caruso. Caruso wielded a chain saw mounted on an extendable pole and powered by a battery pack. Pruning in Sicily is mostly done with regular chain saws, but also with handsaws and shears, as we had done. He moved on to another tree. And within a few minutes he’d transformed it. The location was redolent of history: 6,000 olive trees on a former noble estate in Torretta, a valley town near Palermo. The sprawling villa, once a monastery, recalls a Sicily of opulent leisure and eccentric aristocrats. To an untrained eye, the orchard could appear fine. But a lot is going wrong, Caruso said. Many trees suffer from neglect and disease. “In this area, no one prunes anymore,” lamented Gregorio Ugdulena, a descendant of the family that developed the estate. His sister, Amalia, remembered when field hands clambered up high ladders to prune, and boys carried pots of tar to heal the trees’ fresh cuts. 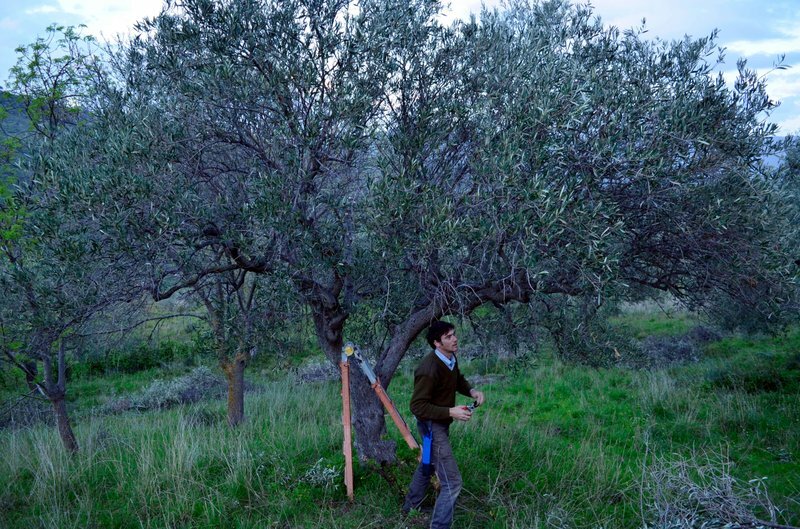 “Many people have abandoned their olive orchards,” Gregorio said with a sigh. That’s why he brought in Caruso, an energetic former bersagliere (an elite rifleman) in the Italian army. In the past four years, Caruso has trained himself in the polyconic vase method. He now does workshops in Sicily, where Ugdulena, and I, met him. It is early April, the end of a long pruning season for Caruso and also for my wife and me. We’d spent much of the past few months learning to prune our long-abandoned, 40-odd olive trees. For beginners, pruning any tree can be daunting. Where to start? What damage will I do if I cut this branch instead of that one? Will I kill a tree? Can I climb into a tree to prune? How exactly should I cut off a branch? A look at the trees around us made us even more confused. Many were pruned so heavily that only a few limp twigs were left dangling off main branches. The sound of chain saws was routine. Slowly, we gained confidence and speed. We started with obviously depleted dry sections, suckers and overlapping branches, and then moved on to what wasn’t so obvious. It took hours to prune the bigger specimens. Caruso stood in a section of the orchard planted with Nocellara del belice trees. They looked nice to me. But not to him. “The trees lack leaves and there are many diseases,” Caruso said. “Look around: It’s surrounded by mountains so there isn’t any circulation, and there’s a lot of humidity.” Humidity is bad for olives, he said. At his side was Giuseppe Lo Presti, a 41-year-old agronomist and olive tree specialist. Lo Presti stooped to inspect a dead tree. “Look, this is what happens when you don’t cut right,” he said. Someone had cut into the trunk, allowing infections in. Caruso moved on, his chain saw whirring into action. The new technique has been met with skepticism in the region, Caruso said. Resting a foot on a wall overlooking the orchard, he recounted how three men stopped to criticize him, an outsider with a never-before-seen helmet. He wears it because he works from the ground and could be hit by falling branches — he has a scar to prove it. A good pruner must understand how a tree functions so that every cut makes sense, Caruso and Lo Presti agreed. When I came home, I saw trees that still needed work. But I was glad we hadn’t bought a chain saw and sawed away. We are trying to balance many things, including maintaining the aesthetic beauty of long gnarled branches, and avoiding power tools. We want to watch and learn how our trees respond to what we’ve done. Already this spring, we’re pleased at how the now-thinned-out olives are flowering. Did we play a hand in creating all the lovely small yellow clusters? I like to think so.